and winner of 2012 Volunteer Award of the South Australian Murray-Darling Basin Natural Resource Management Board. Jeff and Yvonne Drogemuller have a mixed farming enterprise opposite Yatco Lagoon and they own a portion of the floodplain. Jeff’s grandfather owned the property which included part of the floodplain around Yatco Lagoon. The Drogemullers and Burdons next door were the first irrigators to relocate their pumps from the lagoon to the river in 2004 and their actions demonstrated the significant economic benefits and environmental opportunities created — such as better water quality, reduced filtration costs and the recent opportunity to dry the wetland levels down without affecting their access to water. Being the first is not unusual for Jeff’s family, his great grandfather was the first farmer in Moorook, establishing a family farm there in 1895. Today the land use is more environmentally sustainable with a smaller planting of vines and citrus and diversification into saltbush grazing and shedding sheep. Jeff’s great grandfather, Heinrich Wilhelm Friedrich Drogemuller, known as “Fred”, came to Australia on the ship Lawrence, arriving in Adelaide on 5th November 1854.He was 7 years old. The family moved to Hahndorf and then settled in Palmer. Fred married Auguste Marie Louise Koch on the 6th February 1872. He first saw the Murray River in 1876 and settled on the Murray River at Younghusband. 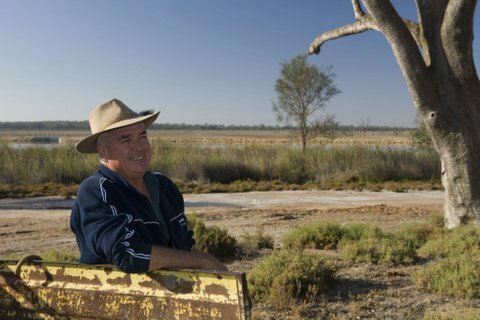 As the years went by Fred decided to sell the farm and strike out for the new country on the Murray where it was said that a man might have a chance to better himself. It took 2 days to travel to Moorook, the road was just a bush track and Fred became the first farmer to settle in the village in 1895. The settlements of Moorook and Kingston had only been a year in existence. He (Fred) found the country a terrible mess. There was not a vestige of green grass. Rabbits were in the millions and had eaten the whole land bare. Text from the book Drogemuller Family History by Anita Schwarz 1986. Fred’s farm was 3,000 acres. Together with his sons and the help of labourers they cleared much of the country. He built 2 homes in Moorook, the second home was built from limestone (ruins pictured) and had 6 rooms, a breezeway, a cellar, a bread baking oven and a bull-nosed iron veranda. Fred would sit on the veranda and consult in traditional homeopathy to callers who had heard of his reputation. 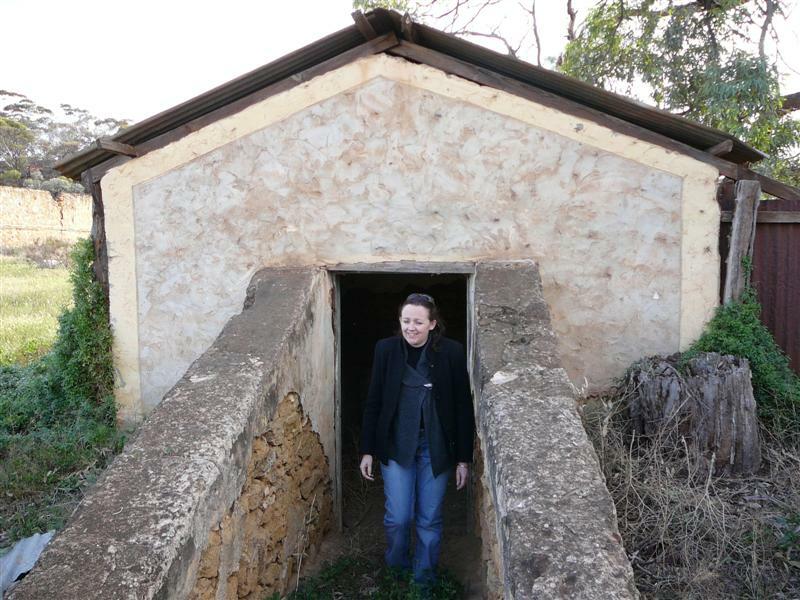 There was no doctor in the district and callers would come from as far as Pinnaroo. Fred also travelled to visit hundreds of patients. He died in Moorook on the 4th May 1939 aged 89 years. Fred’s son Fred (Jeff’s grandfather) built a third stone home in 1906-07. Windmills were used to pump water from the lagoons up to the farms as early as 1915. Jeff’s father and mother established a 3,000 acre cereal farm out at Yinkanie where Jeff was born. Jeff worked for his father, farming and fruit growing, and during the droughts in the 1950’s they diversified into irrigation on their family property in the early 1960’s, establishing lucerne crops, peas and tomatoes. In 1964 they planted their first permanent crops — navels and valencies — and irrigated them with Monsoon Mark 1 sprinklers and water sourced from Yatco Lagoon. Jeff moved in to Barmera in 1974 and married Yvonne in 1976. 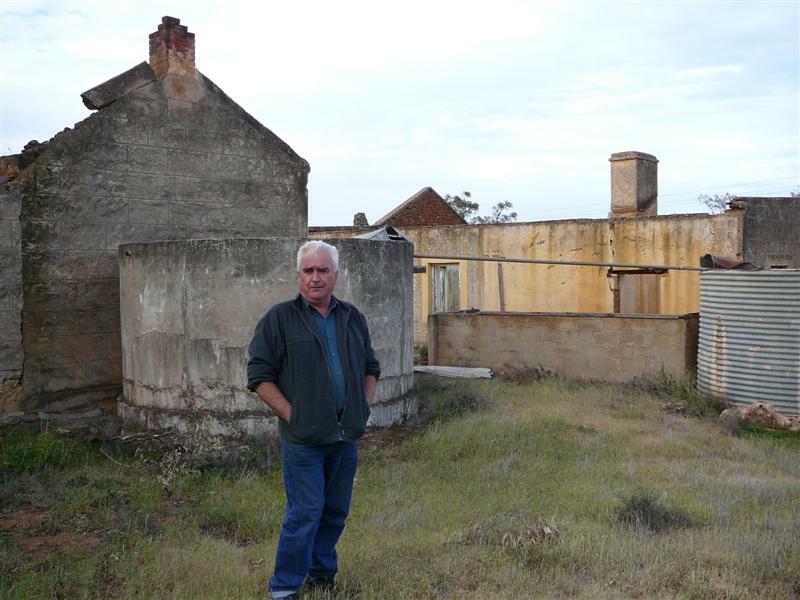 They purchased 90 hectares from Jeff’s father and moved back to Moorook in 1980 where they built on their current house site overlooking Yatco Lagoon. Their original pump site was located in a 1.8m deep sump at the end of an earth channel off the lagoon. The sump attracted snakes which had to be removed before the pump could be turned on or off. The channel was later replaced by a sealed 18 inch pipe that delivered water to a small pond where the pump was relocated. The pond was easily cleared of weeds with a backhoe. Irrigation became more sophisticated and overhead sprinklers were replaced with low throw sprinklers, however, constant high turbidity wore out the internal pressure regulating devices and caused more problems. In 1993 Jeff participated in several practical irrigation training courses and adopted new methods of irrigation scheduling which he still uses today. Following the high river of 1993, salinity in the lagoon increased significantly due to poor flow through the lagoons. Salt build up in the south lagoon was flushed into the north lagoon by strong southerly winds thereby increasing salinity levels at Jeff’s pump off-take on the north lagoon. As a result, Jeff dug a new channel to extend a natural creek (Middle Creek) from the river into north lagoon thus increasing flow into the lagoon and reducing the salinity levels. The aim was to freshen the water around the irrigation pump. From 1996 to 2010 there was only one high river (2000) and the lagoon was regularly 200 EC units higher than the river, around 600 EC. When the lagoon reached 1,500 EC units in the early 2000’s Jeff decided to relocate the irrigation pump to the river, which he did in cooperation with his neighbour George Burdon, who also sourced his water from the sump established by Jeff. Jeff’s new supply line was completed in 2003/04 consisting of a 2 km pipe across the floodplain and a low lift pump on the river, pushing water to a high lift pump on Jeff’s property on the edge of Yatco Lagoon. The irrigation water quality improved immediately and all crops showed immediate health improvement, however, serious water restrictions were imposed due to the drought (2006 to 2010) and water had to be leased in to keep plantings alive. Production dropped and Jeff’s ability to service debt associated with the new pipeline placed significant pressure on the business. The Federal Government was offering a grant for modernization of infrastructure at a time when crop yields were low, prices were down and costs of water were escalating, and Jeff took the opportunity to modernize and downsize their overall plantings in return for water saved, thus helping to reduce overall operating costs. Jeff’s believes that individual leadership can influence group understanding and behaviour. 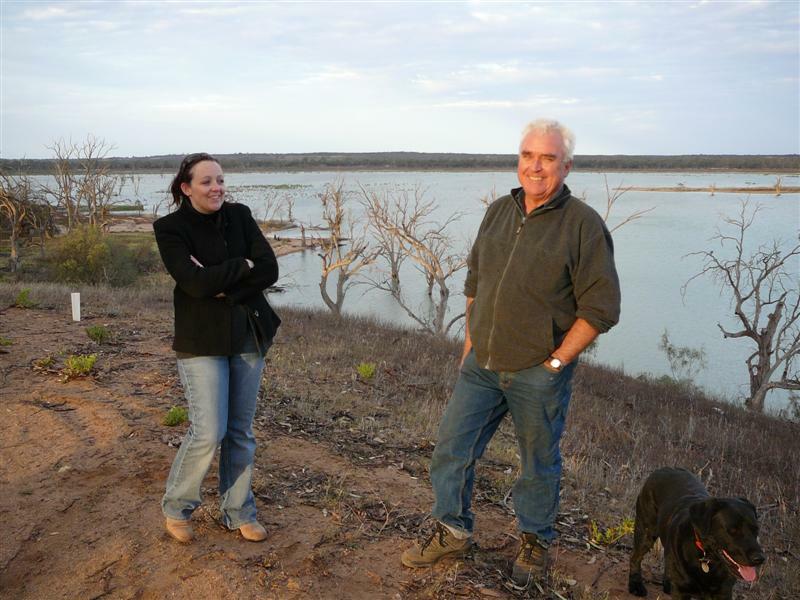 He believes that the Yatco Wetland Landcare Group has helped to achieving shared understanding through cooperation. By getting together there is more trust within and between individuals. The Moorook community has always had a strong environmental interest and early leadership included the establishment of the Moorook Tree Planters who received a grant from Greening Australia and then follow up grants from the Murray Darling Basin Commission’s Natural Resource Management Program in the 1990’s. When the group disbanded the $11,000 bank balance was used to purchase a pump to continue to water the trees. Moorook Tree Planters established the avenue of salt tolerant trees and shrubs on the roadside between the Moorook Game Reserve and the town of Moorook. The Moorook and Yatco Irrigators also participated in the RiverCare Irrigation Management training workshops in the early 1990’s. The compulsory drying of the lagoon was a response to the severe drought and the need to save water by reducing evaporation losses, however, there have been significant environmental benefits and these will continue now that a plan is in place to continue to vary the water levels in the lagoons. The flooding that followed in 2010/11 which was the first major flood in 17 years has also helped to improve the Yatco Lagoon environment. The main benefit has been the instant recovery of yabbies when the wetland was first refilled after its first complete drying in 83 years. The return of the yabbies and germination of new red gums around the shorelines will continue to be a major benefit of the wetting and drying schedule. Aquatic plants are recovering and increasing. Many Musk Ducks have been sighted on the lagoons and several pairs have bred. Photo points capture the environmental changes. Callie Nickolai has images of regrowth around the lagoon. Lignum and red gums have regenerated. Vegetation surveys will help to quantify this. Jeff regards the ability to achieve debt free status as the most satisfying outcome thanks to restructuring their operations and Yvonne’s off farm income. This provides Jeff with a property he can easily manage and more time to care for Yatco Lagoon. The most pleasing aspect of the Yatco Wetland Management Plan is that the Government is now listening to the landowners and valuing its experience. It is very exciting to see the environmental response following the forced drying of Yatco Lagoon in 2008, similar to the response after the first drying of Banrock Station lagoon. In the initial stages of moving to dry out the lagoon to save water, the process was very rushed and in the rush the Government (State Government) took too much responsibility away from the community, but now the balance is about right. The Yatco Lagoon Wetland Management Plan has kept the community and the Government focused on the core objectives and therefore everyone will benefit. It is sad to have seen so many red gums around the perimeter of the lagoon die since the mid 1990’s, but the recovery has started. Acid sulphate development (anticipated during the drying process) was not disastrous due to the limestone base under the lagoon which helped to neutralise the pH. The ability to learn from the number of scientists now involved in the Yatco Project has been very rewarding.